To anyone brought up in Britain in the 1970s Michael Parkinson was, by virtue of his eponymous chat show on BBC television, one of the best known figures in the land. His stature grew with every passing year, boosted particularly by his confrontation with Rod Hull and Emu in 1976 which, and perhaps this is just my age showing, still brings a smile to my face every time I see it. In time it became clear to me that Parkinson was a cricket lover, something guaranteed to elevate him further in my estimation. What I particularly liked about him was that whilst you could tell as soon as he spoke that he was a Yorkshireman, he didn’t have one of those ‘in your face’ northern accents that begin to grate after just a few minutes. He is also an essentially modest man. It was many years before I learnt that in addition to his love of the game Parkinson was also an accomplished batsman, good enough to have attracted serious interest from Yorkshire in his youth, and a fine writer. 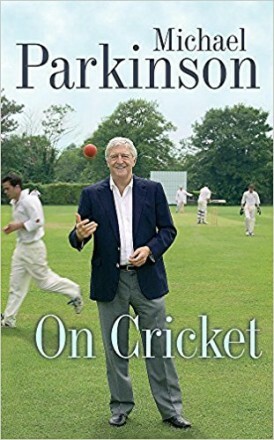 Cricket’s loss proved to be the media’s gain, and amidst all the entertaining interviews with the great and the good of the entertainment and sporting worlds in particular it is easy to forget what Parkinson started out as, a journalist on a local newspaper. In time he moved on to the nationals, but I have to confess to having no recollection of ever taking any particular notice of his writing. I suspect it must simply be the case that I never read any of it, because if I had I am sure I would have been impressed, even as a youngster. Fast forwarding almost four decades I was persuaded, a couple of years ago, against my better judgment and on the basis of what proved to be a hopelessly optimistic weather prediction, to take a weekend break on the coast. Shortly after we arrived my partner had to take to her bed, under attack from flu like symptoms. We had no rain, but the sky was grey and unforgiving, and the temperature about half what it should have been. One problem, the size of which I saw increasing with every glance at the increasing pallor of my beloved’s face, was that as part of ‘the deal’ I had agreed not to take any reading material with me. Being the dutiful sort I naturally volunteered to find the nearest chemist in order to find something to alleviate my loved one’s discomfort. Having located a pharmacy a couple of streets away from the hotel, and purchased the requested medication, on the way back force of habit ensured I put my head round the door of a charity shop that had a small display of books in its window. There was only one volume on cricket, but at least I didn’t already have it, so I happily donated my 50p and wandered back with a box of what I had been assured was the most powerful cold remedy that could be bought without prescription, and a copy of Parkinson on Cricket. On my return to the room I could already hear the gentle snoring that confirmed conversation would not be necessary. Even though it was a Saturday afternoon I wasn’t about to risk the consequences of turning the television on, so settled down as best I could in the singularly ill-designed bucket chair in the corner of the room. Ironically this enabled me to look out over a cricket pitch – by now though rain had clearly stopped play, so my choice of entertainment was either my newly acquired book or the lengthy list of possible side effects of the cold remedy. It wasn’t a difficult decision. As the title suggests Parkinson on Cricket is an anthology, albeit a little more than a collection of essays. The first quarter of the book amounts to a cricketing autobiography, but not in the traditional sense. It is more a selection of stories from Parkinson’s youth and his own playing days, almost all with a touch of humour, and without exception singularly lacking in any sort of arrogance. I won’t claim to have gone straight to those pages, but they were no less enjoyable for being left until later. Most of the rest of the book amounts to a collection of pen portraits. Many have written such essays in the past, not least amongst them this reviewer, but the huge advantage that Parkinson has, quite apart from having a very obvious talent for writing carefully honed in the hard school of real journalism, is that he knew all his subjects, indeed not only had he met them those meetings were of equals, and whilst many of the subjects were his sporting heroes, Parkinson is no psychophant. As soon as I opened the book I was drawn by the contents page to an essay on Harold Larwood, written as an obituary shortly after the great fast bowler’s death. It is a superb piece of writing and for anyone reading just one piece on Larwood this should be it. Parkinson was lucky enough to meet Larwood on three occasions, the first of which was at a lunch where they were joined by Jack Fingleton, Keith Miller, Ray Lindwall, Arthur Morris and Tiger O’Reilly. The story is largely constructed around what was discussed between those great men – oh to have been a fly on the wall in that restaurant! Fingleton, O’Reilly and Miller get chapters of their own as well, as do other giants of the game like Garry Sobers and Denis Compton. All of these essays add something to what we know of the personalities of the men concerned. The chapter on Dickie Bird, with whom Parkinson opened the batting for Barnsley, consists of more than one piece of work, each hugely entertaining and clearly written with great affection. There is also a short article on John Arlott, which references a conversation between Arlott and Sir Neville Cardus which creates another of the many ‘wish I had been there’ moments that litter the book. One particularly thought provoking chapter in Parkinson on Cricket is on the subject of Wilfred Rhodes, born in 1877 and a Test player from the nineteenth century. Parkinson met Rhodes as well, and the essay on him sits comfortably alongside those on a couple of Lancastrians of rather more recent vintage, Michael Atherton and David Lloyd. The wise and perceptive words Parkinson wrote about Atherton were written four years before his last Test, and it would be interesting to know what Parkinson thinks of the 2018 version of Athers. Similarly with Lloyd the piece on him was written 25 years ago, so well before ‘Bumble’ became a national treasure and a cottage industry in his own right. If asked to review his thoughts on Bumble now I suspect Parkinson would produce a very broad grin, wink, and change the subject, as long as it wasn’t on to his memories of ‘that bloody bird’ (Messrs Hull and Emu). No single book on cricket could really be described as truly essential reading, and Parkinson on Cricket is no different, but for those whose interest lies in the great names of cricket’s past it is an absolute delight and, at barely a couple of quid on Ebay including postage, an absolute steal.